Ever felt the urge to find out how much your MEP earns from activities outside the European Parliament? Fear not, for help is at hand. The pressure group Transparency International has collated information made available by the parliament, and put it all together on a user-friendly website. A few headlines. Nearly half of all MEPs have declared no outside financial interests at all. But 398 MEPs cumulatively earn up to 18.3m euros (£14m; $23m) per year. And a select few - 12 MEPs in all - each earn more than 10,000 euros per month, above and beyond their generous parliamentary salaries and allowances. Among the biggest earners from "outside jobs" are the leading liberal MEP Guy Verhofstadt, and two former French ministers - Michele Alliot-Marie and Rachida Dati. A first version of this blog also put the UKIP MEP Bill Etheridge in Transparency's Top 12. But it appears that Mr Etheridge entered his personal data incorrectly on his parliamentary form. He is actually declaring that he earns more than 10,000 euros per year, not per month. But however much the amounts, why should any of this matter? There is no law against extra earnings. 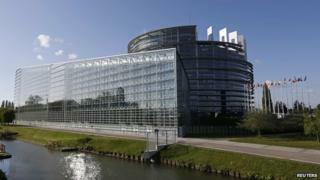 Transparency International says it doesn't take a view on whether MEPs should be allowed to hold other jobs while they are in office. But it is concerned about the obvious potential for conflicts of interest. "The system isn't working," says Carl Dolan, the director of Transparency International EU. "Trust in decision-making requires effective checks and credible sanctions on possible conflicts. Unfortunately, the parliament's current efforts pay only lip-service to this principle." The trouble is that the parliamentary declaration forms are so vague that it is hard to find out more details about what many MEPs actually do in their spare time. "Consultant" and "Manager" are frequently-used terms. Campaigners want the parliament to have much clearer guidelines, and effective sanctions against anyone issuing false declarations. "The rules usually only change in the wake of scandals," Mr Dolan says. "We're trying to persuade the European Parliament to get ahead of the game." In the last few weeks MEPs have made plenty of noise in confirmation hearings about potential conflicts of interest among incoming European Commissioners. Perhaps they now need to put their own house in order. This blog was first published on 13 October but updated following new information on Bill Etheridge's non-EU earnings.